Around this time of year, many people face a common dilemma – the fully-functioning Christmas tree lights we placed in storage in January or February have become non-functioning Christmas tree lights in December. So, we make sure that all bulbs are present and secure in their socket, we plug them in again and hope for the best. When this does not produce the desired result, we consider whether it is worth our time to troubleshoot further or to brave the hordes of Christmas shoppers and buy new lights. But lights connected to some “pre-lit” trees can present an addition level of frustration. That is, some pre-lit trees have strings of lights permanently affixed to the branches. When lights malfunction on these trees, you must decide whether to buy a new tree, purchase and attach strings of lights that may or may not match the functioning lights, or employ potentially extensive troubleshooting. Those who know me well can attest that my personality type is one of an “off-the-charts” problem solver. Those who know me best know that I live in a small convent community of “off-the-charts” problem solvers. So it should come as no surprise that, when presented with a pre-lit Christmas tree that had become a “partially-lit” Christmas tree in our convent home, we rolled up our sleeves and tried to figure it out. Knowing that just one missing bulb can make the whole string malfunction, we checked to be sure that all sockets contained bulbs, filling those that did not. Then, we double-checked that all bulbs were secure in their sockets. Following this painstaking procedure, I would like to have reported that all bulbs glowed like the Star of Bethlehem – but, none of them offered even a sliver of a twinkle. This did not make sense! After all, Christmas tree lights work in parallel circuits. (Everyone knows this, right?) When all bulbs are present and secure in their sockets, those with intact filaments should light while those whose filaments are broken will never light again. So, why were none of the lights of many of these strands still unlit? Our next step was to check the fuses embedded in the plug. How exciting it was when replacing one set of fuses made a difference, lighting at least 75% of the unlit strands! At this point, we had spent so much time problem solving that we had begun to consider how to best position the tree that the still-unlit parts could not be seen from the front. But, the unlit parts were distributed throughout the tree, so no matter which way we turned it, dark patches faced the front. Retrieving a strand of similar lights from storage and determining that they lit, we began to test every single socket of the tree bulbs with a bulb that should have lit. We didn’t count, but I would guess we were up to the 30th socket when the lights went on! There were smiles and shouts and high-fives . . . and a small strand of still-dark light bulbs! Yes, we continued to troubleshoot and no, we did not completely solve the problem. Our extensive problem-solving session had produced only a partial solution, but we were out of time, energy and answers. The tree’s lighting was so much better than when we had started. By repositioning lit branches around unlit branches, we were able to hide the flaws and have a presentable, but far from perfect, Christmas tree for 2016. And, in the process, we discovered that an imperfect Christmas tree is a perfect Christmas prayer. Prefer light over darkness. Not once did we consider an unlit Christmas tree as a viable option. Since Christmas is about the coming of the “true light which enlightens everyone” (Jn 1), we must prefer light over darkness – always and all ways. Long for the Light. Obsessing over Christmas tree lights during the fourth week of Advent allowed us to long more deeply for the Light to come at Christmas. After all, why were we doing any of this – or why do we do anything that we do – if not for our longing for Jesus, the Light of the World? Persevere in spite of imperfection. What better example do we have of this than the story of the birth of Jesus? That story is filled with imperfections! An unwed mother, her betrothed about to divorce her, going into labor while traveling, no room to stay, giving birth in a stable, fleeing to Eqypt and the unspeakable killing of “the innocents” – these are decidedly not the ingredients of perfection. Yet, both Joseph and Mary persevered because there was simply no way that they could allow the darkness to overcome the light. Through their perseverance in spite of serious imperfections along the way, we are saved. Everyone at the Passaic Neighborhood Center for Women wishes you and yours a very blessed Christmas. Thank you for your ongoing support. You are the reason we can continue to serve so many Passaic families. On Tuesday, the women of the Center hosted a small Christmas celebration. We are always happy when our women are in charge of the food, as we get to sample delicacies made by good cooks from various cultures. We are doubly happy when the women are in charge, because their sense of ownership of the Center means that we are on the right path toward fulfillment of our mission. As you enjoy some photos of the celebration, know that we are especially grateful to our supporters who make the Center possible. Thank you and God bless you abundantly -- at Christmas and always! Today we are pleased to host a "Know Your Rights" workshop for the women of the neighborhood. This workshop provides a forum for our women to express their need for more information regarding the intricacies of immigration laws in the United States. Providing a safe and peaceful environment for this type of workshop is a direct fulfillment of the mission of the Passaic Neighborhood Center for Women. We are so very grateful to our presenters, Claudia, Rosa and Rosalba, who are giving their time today to help our women. When is a tree more than a tree? The Christmas tree in this photo is located at the Paterson Diocesan Center in Clifton, NJ. 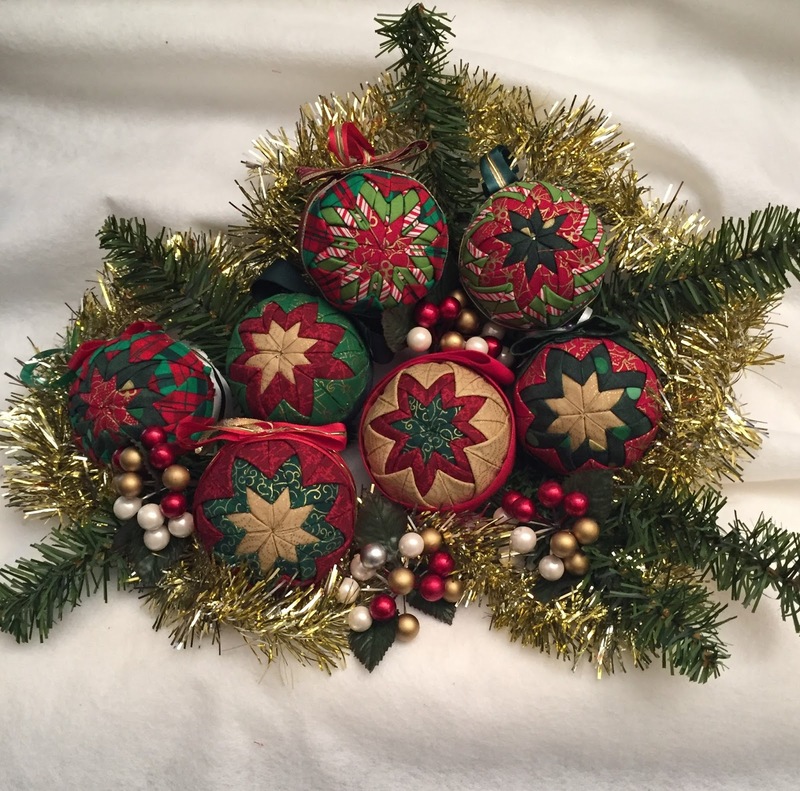 Note that some of the ornaments are rectangular, while some are star-shaped or tree-shaped. Initially, the tree was decorated with the rectangular ornaments, which contained requests for food assistance for the women of the Passaic Neighborhood Center for Women. When someone takes the ornament to fulfill the request, that ornament is replaced with a star or tree ornament with the donor's name written on it. In this photo, the star ornaments are readily visible. Take a good, reflective look: These ornaments represent families that will have food this Christmas because of the generosity of the employees of the Paterson Diocese -- for the second year in a row! These are the same people who have supported us in so many ways over the past three (plus) years. So, when is a tree more than a tree? When it is filled with the love of brothers and sisters for their brothers and sisters in need. "Whatever you did for these least brothers and sisters of mine, you did for me" is a lived reality today and every day at the Diocesan Center! We are so very grateful! for newborns at St. Mary's General Hospital, Passaic. 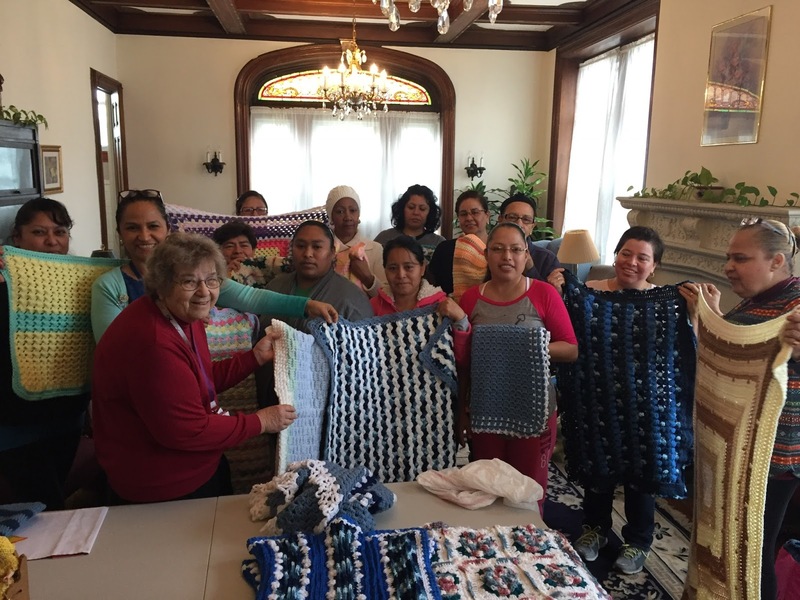 On Tuesday, our friends Sister Anne Moroney, SC and Luz Flores visited the crocheting class to accept a gift on behalf of the babies born at St. Mary's General Hospital, Passaic. Sr. Anne and Luz comprise the Community Health Outreach Department at St. Mary's. We collaborate with them frequently -- sometimes daily. So, when our crocheters wanted to do community outreach, it was only natural that they would create blankets to be given to the parents of babies born at St. Mary's when the babies are discharged. We are thrilled that the babies of Passaic will be wrapped in the love of the women from the Passaic Neighborhood Center for Women. Thanks to our Associate Director, Sister Elaine, FSP, for coordinating this project. 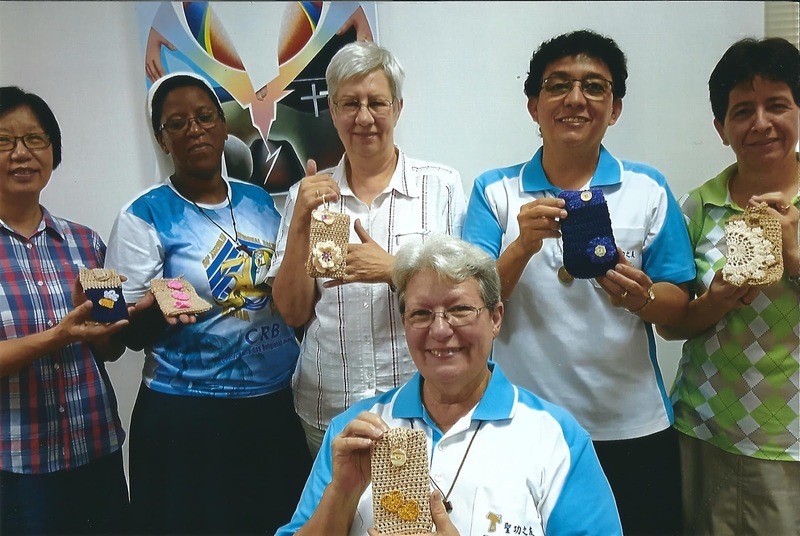 You will recall back in October (see this post) that our crocheters made eyeglass/cell phone cases that were taken to the General Chapter of the Missionary Sisters of the Immaculate Conception of the Mother of God (SMIC) in Taiwan. Now, we are able to show photos from Taiwan of the delegates and leadership with their cases! Thanks to Sister Eleanor and Sister Joanne for making these photos possible. We also thank all of the SMICs (all over the world!) for their consistent support of the Passaic Neighborhood Center for Women. Each year, the staff members of St. Mary's General Hospital, Passaic, make food baskets for Thanksgiving. For the past three years, the women of the Passaic Neighborhood Center for Women have been recipients of some of these baskets. We are extremely grateful to everyone at St. Mary's -- especially Sister Anne Moroney, SC and Luz Flores who coordinate the basket distribution -- for their overabundance of generosity. In these days of food insecurity, it is so good for our women and their families to receive these gifts. Thank you!! We are so happy to expand that this collaborative ministry has expanded to include this parish family. Especially during Thanksgiving week, we are happy to be able to provide our women and their families with a "little extra" that makes a huge difference! From the Catholic Legal Immigration Network (CLINIC): "The new administration is expected to make significant changes to current immigration policy. The details of what President-elect Trump will actually do on immigration are unknown, but we have prepared some resources for you . . ."
Please click here to access CLINICs "Preparing for Changes in the Presidential Administration" materials. Please share widely with those who might need this information. From being cautious about scammers to what to do about DAPA and DACA status, this is crucial information for every immigrant. We ask for your continued prayers for our ministry as we continue to provide a safe and peaceful place for the women of Passaic to express their needs. Sunday was a busy day! The Sisters of Charity of Saint Elizabeth, Convent Station, NJ, celebrated the dedication of the Shrine of Blessed Miriam Teresa. It was wonderful to be among so many of the Sisters of Charity, who have been so supportive of the Passaic Neighborhood Center for Women! We congratulate them and we pray in a special way to Blessed Miriam Teresa, asking her to intercede for our ministry here in Passaic. by Bishop Serratelli on Sunday. On Sunday evening, we were happy to speak to the Confirmation candidates and youth group at St. Anthony Parish, Passaic. We were able to share the good news of the Center with the young people and their mothers. What a great, responsive group! As readers of this blog know, the Passaic Neighborhood Center for Women has been blessed to be a collaborative ministry involving, among other organizations and individuals, various religious congregations. 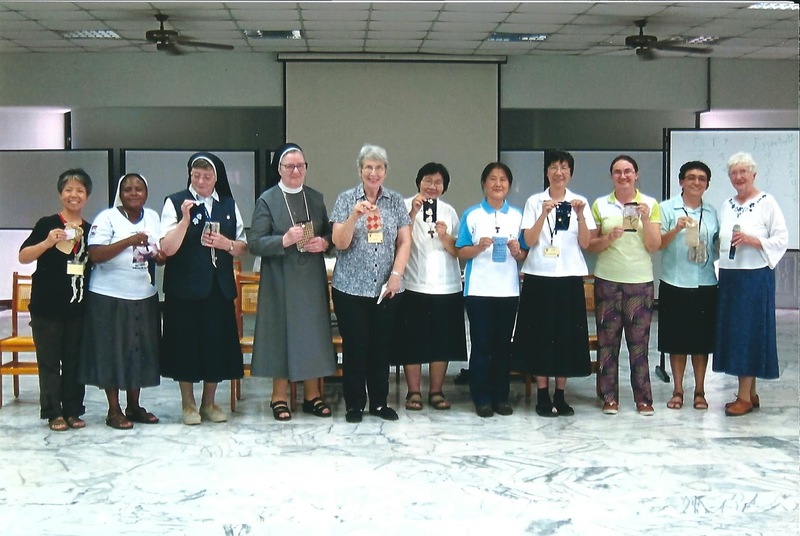 The Missionary Sisters of the Immaculate Conception of the Mother of God (affectionately known in abbreviated fashion as the "SMICs") have supported the Center since before its opening and continue to support the Center in many ways. So, when Sister Eleanor requested to purchase hand-made gifts to take to the delegates of the SMIC General Chapter in Taiwan in November, our crocheters jumped at the chance! Pictured below is Sister Eleanor, SMIC, our Monday morning English teacher and member of our board of directors, with Elizabeth, who crocheted three of the 15 cell phone/eyeglass cases that will travel from Passaic to Taiwan next month. We're so happy that the Center continues to touch lives globally (as work from our quilters has been sent to Haiti in the past). The women did a great job in choosing the exact yarn that would be light enough to pack and sturdy enough to retain the shape of the case. We hope that the SMIC General Chapter delegates enjoy their cases as much as our women enjoyed making them. We send our prayers with Sister Eleanor, Sister Joanne, all the delegates and the entire SMIC Congregation during their Chapter. Grateful for Three Years and Counting! Nancy watches the children while their mothers take classes. 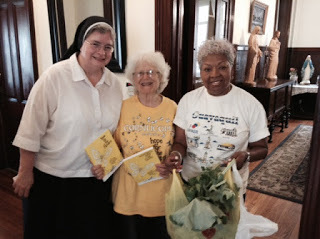 Sister Marcella, FSP, has given over 200 hours of volunteer service! Sister Eleanor, SMIC, has been a part of the Center since BEFORE it opened! Sister Margaret, SMIC, has given over 100 hours of volunteer service! Claudia, our "right-hand" from City Green, is now also an English teacher at the Center! Sister Pat, SC, has given over 300 hours of loving service! Sister Gerardine, SCC -- once a volutneer, now a staff member. Sister Elaine, FSP, has been our Associate Director from the beginning. Angela, a member of St. Anthony's Parish, Passaic, shares her joy with our children. Our newest volunteer, Sister Patricia, MPF, teaches English at the Center. On Sunday, September 4, Sister Ann Marie gave a presentation, "Mother Teresa: A Saint of Mercy in the Year of Mercy" at Good Shepherd Parish in Andover, NJ. Coinciding with the canonization day of Mother Teresa, the presentation focused on the Extraordinary Jubilee of Mercy, its relationship to St. Teresa of Calcutta, and its meaning in our daily lives. As always, Sister Ann Marie took this opportunity to share the good news about the Passaic Neighborhood Center for Women with this crowd of over 50 participants. It is always good to be able to visit various parishes in the Paterson Diocese to thank the parishioners for their contributions to Partners in Faith, the diocese's capital campaign which had the Center as one of its case statements. This Center would not exist without the Partners in Faith donors, to whom we are so very grateful. In delving more deeply into Mother Teresa's life and ministry, we find that her way of ministry is similar to ours here in Passaic. While we do not take a fourth vow of "giving wholehearted free service to the poorest of the poor," as the Missionaries of Charity do, we follow this directive to the best of our ability. Our donors make this possible. Thank you! We are grateful to Nick Berg, Evangelization Director at Good Shepherd, and to the entire parish family, for this invitation and the hospitality they shared on Sunday. If any of our loyal blog readers have Facebook accounts, we are asking you to consider "liking" the page of the Passaic Neighborhood Center for Women. Click here to go to the page. Of course, we'll continue to post here on the blog, but the Facebook page will provide another way to tell the beautiful story of the Passaic Neighborhood Center for Women. Thank you! In a ministry such as the Passaic Neighborhood Center for Women, we do not speak in terms of large victories. There is no "grand assessment tool" that spits out percentages that we employ to prove our abundant success. Most of our "data" is anecdotal and is usually collected informally, unexpectedly and in small amounts. So, the only way to "gather evidence" that will attest to the success of this ministry is to be present to and to remember these small, grace-filled moments. This morning, we had just such an informal and unexpected moment of grace. One of our women came to the Center as usual at 9 am to work with the Rosetta Stone program for an hour. At 10 am, she attended her English class. At 11 am, she was ready to depart. What made today different, though, was that she had her young sons, ages 7 and 9, with her. (Because the Passaic schools offer a summer enrichment program, the boys had been in school most of the summer. However, that program ended August 12, so today she brought the boys with her to the Center.) None of that is really extraordinary. However, what happened as they departed made our day! As they were walking out the door, the seven-year-old son said (rather excitedly) to his mother, "Can we go to the garden?" In a ministry such as ours, those six words are golden! Why? Because by saying those words, the young boy was unwittingly saying to us, "You are fulfilling your mission." When a seven-year-old boy -- after two hours of being at a center for women on a summer morning -- expresses the desire to stay longer in order to garden, he does not realize how many religious communities, organizations and other people collaborated to make the garden a reality. He is not consciously aware that his family is being strengthened by his mother's participation in the programs here. He is not commenting on the empowerment of women that has taken place as a result of the building, planting and sustaining of our garden in the midst of this urban area. He simply knows that he enjoys being in this space that seems to be so important to his mother and the other women. He knows that each time he visits the garden, it has grown to be something different from the last time because he has witnessed this process all summer long, especially as the tomatoes turned from green to red. He knows that a visit to the garden means that he will probably take something home that his mother will use to make lunch or dinner. These six words spoken by this young child provided us with grace-filled evidence that continues to tell us that this ministry is necessary and appreciated. Our task is to stay tuned in -- in this case, to open the door for a woman and her children as they left the Center -- so that we never miss the opportunity to "gather the evidence" provided by these small moments of grace. Thanks to our iGive supporters, we have raised $65.17 to date. While that might not seem like much money to raise in a little more than a year, consider the fact that it's free! Just by downloading the iGive button, choosing the Passaic Neighborhood Center for Women as your cause and doing your normal online shopping, participating merchants donate a portion of your purchase to us through iGive. Remember, the cause is Passaic Neighborhood Center for Women. Thanks for your ongoing support! We cannot do this without you! How does OUR garden grow? With much collaboration! 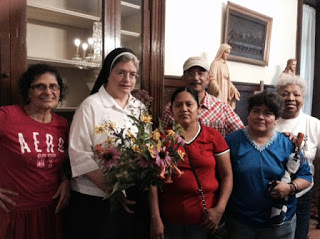 In May 2013 in one of her first weeks as director of the Passaic Neighborhood Center for Women, Sister Ann Marie visited Josephine's Place in Elizabeth, NJ (a sponsored work of the Sisters of Charity of Saint Elizabeth, based in Convent Station, NJ). The purpose of the visit was to seek advice about running a women's center from Sister Judy Mertz, SC, founding director of Josephine's, who was in her tenth year there. Providentially, it was the day that the women at Josephine's Place were planting a garden. In conversation with those who were planting the garden there, Sister Ann Marie found out that an organization called City Green in Clifton, NJ would be able to help the Passaic Neighborhood Center for Women to plant a garden. allowed us to dream about growing our own garden. Aided by the wonderful folks at City Green, we applied for and received a grant from the Passaic County Board of Chosen Freeholders' Open Space Trust Fund, which funds City Green's Dig In! program. During our three years of gardening, we are so grateful to have received close to $3,000 from this fund. With assistance from City Green, the Community Health Outreach Department at St. Mary's General Hospital, various religious communities and the Center's benefactors, we built three small garden beds behind the Center where we planted herbs and vegetables. of the Center); our women and some of their children. This is a colorful portion of our 2014 crops! Flash forward to year two (2015): Enough interest was generated from the success of year one that each gardener wanted to have her own garden bed in year two. Through the generosity of the pastor of St. Nicholas Church, we were able to secure enough land to plant ten individual beds behind the church. 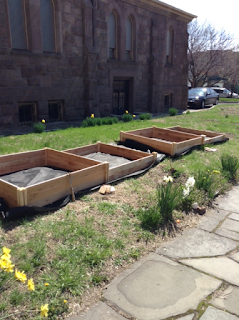 With lots of assistance from City Green and the New Jersey Youth Corps from Paterson, NJ, our year two beds were constructed. Construction begins on our 2015 garden . . . Youth Corps, and -- of course -- our gardeners. How well our 2015 garden grew! Now it is year three (2016): Since the beds were built last year, we are now able to focus on mentoring the gardeners to be more fully responsible for all garden tasks -- from planting to watering, to weeding, to harvesting. Again, we turned to the staff of City Green. In addition to Claudia, we now have the assistance of Rosalba. With their help, our women are becoming expert gardeners and leaders. Additionally, they are growing more crops that they can use to feed their families. In 2016, we planted . . .
. . . and cleaned up the perimeter of the garden area . . .
. . . and harvested . . .
. . . and trellised so we can harvest some more! Who else helps our garden grow? 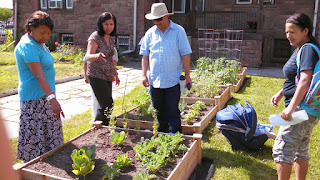 No narrative about our garden would be complete without mentioning José German, a City Green educator and owner of Sustainable Eco-Friendly Landscaping and Gardening Consulting Services. Through the years, José has presented a number of workshops to our gardeners. José educates the gardeners in June 2014 . . .
. . . in September 2014 . . .
. . . and in July 2015, when he brought a special guest with him . . .
Trina Paulus, author/illustrator of Hope for the Flowers. What is next for our garden? We are in the process of participating in research being conducted by Dr. Renata Blumberg, a professor in the Nutrition and Food Science program at Montclair State University. Dr. Blumberg is interviewing our women about their experiences with community gardens. It is our hope that our participation in this research will bear fruit by increasing interest in urban gardening in years to come. So, friends, our garden grows and grows and grows . . . thanks to our staff, our volunteers, our benefactors and EVERYONE with whom we collaborate. Just look at all the hyperlinks throughout this post to see how many people it takes to make our garden grow. To those mentioned in the post and those whose names we might have missed, we say, "Thank you!"